For the food, see Filipino cuisine. Betamax (also called Beta, as in its logo) is a consumer-level analog-recording and cassette format of magnetic tape for video. It was developed by Sony and was released in Japan on May 10, 1975. The first Betamax device introduced in the United States was the LV-1901 console, which included a 19-inch (48 cm) color monitor, and appeared in stores in early November 1975. The cassettes contain 0.50-inch-wide (12.7 mm) videotape in a design similar to that of the earlier, professional 0.75-inch-wide (19 mm), U-matic format. Betamax is obsolete, having lost the videotape format war to VHS. 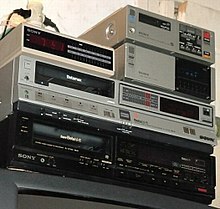 Despite this, Betamax recorders would not be discontinued until 2002, while new Betamax cassettes were available until March 2016, when Sony stopped making and selling them. Like the rival videotape format VHS (introduced in Japan by JVC in October 1976 and in the United States by RCA in August 1977), Betamax has no guard band and uses azimuth recording to reduce crosstalk. According to Sony's history webpages, the name had a double meaning: beta is the Japanese word used to describe the way in which signals are recorded on the tape; and the shape of the lowercase Greek letter beta (β) resembles the course of the tape through the transport. The suffix -max, from the word "maximum", was added to suggest greatness. In 1977, Sony issued the first long-play Betamax VCR, the SL-8200. This VCR had two recording speeds: normal, and the newer half speed. This provided two hours' recording on the L-500 Beta videocassette. The SL-8200 was to compete against the VHS VCRs, which allowed up to 4, and later 6 and 8, hours of recording on one cassette. Sanyo marketed a version as Betacord, which also was casually called "Beta". In addition to Sony and Sanyo, Beta-format video recorders were manufactured and sold by Toshiba, Pioneer, Murphy, Aiwa, and NEC. The Zenith Electronics Corporation and WEGA Corporations contracted with Sony to produce VCRs for their product lines. The department stores Sears (in the United States and Canada) and Quelle (in Germany) sold Beta-format VCRs under their house brands, as did the RadioShack chain of electronic stores. Betamax and VHS competed in a fierce format war, which saw VHS win in most markets. One other major consequence of the Betamax technology's introduction to the U.S. was the lawsuit Sony Corp. v. Universal City Studios (1984, the "Betamax case"), with the U.S. Supreme Court determining home videotaping to be legal in the United States, wherein home videotape cassette recorders were a legal technology since they had substantial noninfringing uses. This precedent was later invoked in MGM v. Grokster (2005), where the high court agreed that the same "substantial noninfringing uses" standard applies to authors and vendors of peer-to-peer file sharing software (notably excepting those who "actively induce" copyright infringement through "purposeful, culpable expression and conduct"). Three Sony Betamax VCRs built for the American market. Top to bottom: SL-2000 portable with TT-2000 tuner/timer "Base Station" (1982); SL-HF 300 Betamax HiFi unit (1984); SL-HF 360 SuperBeta HiFi unit (1988). A rare Japanese market Betamax TV/VCR combo, the Model SL-MV1. The early-form Betacam tapes (left) are interchangeable with Betamax (right), though the recordings are not. Betamax tapes on display at a museum. Betamax also had a significant part to play in the music recording industry, when Sony introduced its PCM (Pulse Code Modulation) digital recording system as an encoding box/PCM adaptor that connected to a Betamax recorder. The Sony PCM-F1 adaptor was sold with a companion Betamax VCR SL-2000 as a portable digital audio recording system. Many recording engineers used this system in the 1980s and 1990s to make their first digital master recordings. Initially, Sony was able to tout several Betamax-only features, such as BetaScan—a high speed picture search in either direction—and BetaSkipScan, a technique that allowed the operator to see where he was on the tape by pressing the FF key (or REW, if in that mode): the transport would switch into the BetaScan mode until the key was released. This feature is discussed in more detail on Peep Search. Sony believed that the M-Load transports used by VHS machines made copying these trick modes impossible. BetaSkipScan (Peep Search) is now available on miniature M-load formats, but even Sony was unable to fully replicate this on VHS. BetaScan was originally called "Videola" until the company that made the Moviola threatened legal action. Sony would also sell a BetaPak, a small deck designed to be used with a camera. Concerned with the need for several pieces and cables to connect them, an integrated camera/recorder was designed, which Sony dubbed a "Camcorder"; the result was Betamovie. Betamovie used the standard-size cassette, but with a modified transport. The tape was wrapped 300° around a smaller, 44.671 mm (1.7587 in)-diameter head drum, with a single dual-azimuth head to write the video tracks. For playback, the tape would be inserted into a Beta-format deck. Due to the different geometry and writing techniques employed, playback within the camcorder was not feasible. SuperBeta and industrial Betamovie camcorders would also be sold by Sony. In June 1983, Sony introduced high fidelity audio to videotape as Beta Hi-Fi. For NTSC, Beta HiFi worked by placing a pair of FM carriers between the chroma (C) and luminance (Y) carriers, a process known as frequency multiplexing. Each head had a specific pair of carriers; in total, four individual channels were employed. Head A recorded its hi-fi carriers at 1.38(L) and 1.68(R) MHz, and the B head employed 1.53 and 1.83 MHz. The result was audio with an 80 dB dynamic range, with less than 0.005% wow and flutter. Prior to the introduction of Beta Hi-Fi, Sony shifted the Y carrier up by 400 kHz to make room for the four FM carriers that would be needed for Beta Hi-Fi. All Beta machines incorporated this change, plus the ability to hunt for a lower frequency pre-AFM Y carrier. Sony incorporated an "antihunt" circuit, to stop the machine hunting for a Y carrier that wasn't there. Some Sony NTSC models were marketed as "Hi-Fi Ready" (with an SL-HFR prefix to the model's number instead of the usual SL or SL-HF). These Betamax decks looked like a regular Betamax model, except for a special 28-pin connector on the rear. If the user desired a Beta Hi-Fi model but lacked the funds at the time, he could purchase an "SL-HFRxx" and at a later date purchase the separate Hi-Fi Processor. Sony offered two outboard Beta Hi-Fi processors, the HFP-100 and HFP-200. They were identical except that the HFP-200 was capable of multi-channel TV sound, with the word "stereocast" printed after the Beta Hi-Fi logo. This was possible because unlike a VHS Hi-Fi deck, an NTSC Betamax didn't need an extra pair of heads. The HFP-x00 would generate the needed carriers which would be recorded by the attached deck, and during playback, the AFM carriers would be passed to the HFP-x00. They also had a small "fine tracking" control on the rear panel for difficult tapes. For PAL, however, the bandwidth between the chroma and luminance carriers was not sufficient to allow additional FM carriers, so depth multiplexing was employed, wherein the audio track would be recorded in the same way that the video track was. The lower-frequency audio track was written first by a dedicated head, and the video track recorded on top by the video head. The head disk had an extra pair of audio-only heads with a different azimuth, positioned slightly ahead of the regular video heads, for this purpose. Sony was confident that VHS could not achieve the same audio performance feat as Beta Hi-Fi. However, to the chagrin of Sony, JVC did develop a VHS hi-fi system on the principle of depth multiplexing approximately a year after the first Beta Hi-Fi VCR, the SL-5200 was introduced by Sony. Despite initial praise as providing "CD sound quality", both Beta Hi-Fi and VHS HiFi suffered from "carrier buzz", where high-frequency information bled into the audio carriers, creating momentary "buzzing" and other audio flaws. Both systems also used companding noise-reduction systems, which could create "pumping" artifacts under some conditions. Both formats also suffered from interchange problems, where tapes made on one machine did not always play back well on other machines. When this happened and if the artifacts became too distracting, users were forced to revert to the old linear soundtrack. In 1988, Sony would again push the envelope with ED Beta, or "Extended Definition" Betamax, capable of up to 500 lines of resolution, that equaled DVD quality (480 typical). In order to store the ~6.5 MHz-wide luma signal, with the peak frequency at 9.3 MHz, Sony used a metal formulation tape borrowed from the Betacam SP format (branded "ED-Metal") and incorporated some improvements to the transport to reduce mechanically induced aberrations in the picture. Beta ED also featured a luminance carrier deviation of 2.5 MHz, as opposed to the 1.2 MHz used in SuperBeta, improving contrast with reduced luminance noise. Sony introduced two ED decks and a camcorder in the late 1980s. The top end EDV-9500 (EDV-9300 in Canada) deck was a very capable editing deck, rivaling much more expensive U-Matic set-ups for its accuracy and features, but did not have commercial success due to lack of timecode and other pro features. Sony did market Beta ED to "semiprofessional" users, or "prosumers". One complaint about the EDC-55 ED CAM was that it needed a lot of light (at least 25 lux), due to the use of two CCDs instead of the typical single-CCD imaging device. The Beta ED lineup only recorded in BII/BIII modes, with the ability to play back BI/BIs. Despite the sharp decline in sales of Betamax recorders in the late 1980s and subsequent halt in production of new recorders by Sony in 2002, Betamax, SuperBetamax and EDBeta are still being used by a small number of people. Even though Sony stopped making new cassettes in 2016, new cassettes are still available for purchase at online shops and used recorders are often found at flea markets, thrift stores or on Internet auction sites. Early format BetaCam cassettes—which are physically based on the Betamax cassette—continue to be available for use in the professional media. Size comparison between a Betamax cassette (top) and a VHS cassette (bottom). Below is a list of modern, digital-style resolutions (and traditional analog "TV lines per picture height" measurements) for various media. The list only includes popular formats. Note that listed resolution applies to luminance only, with chroma resolution usually halved in each dimension for digital formats, and significantly lower for analog formats. The somewhat unintuitive analog resolution loss for 16:9 DVD compared to 4:3 DVD arises from the fact that analog resolution unit is "lines per picture height". When picture height is kept the same, the same 720 pixels are spread to a wider area in 16:9, hence lower horizontal resolution per picture height. Both NTSC and PAL/SECAM Betamax cassettes are physically identical (although the signals recorded on the tape are incompatible). However, as tape speeds differ between NTSC and PAL/SECAM, the playing time for any given cassette will vary accordingly between the systems. Other unusual lengths were produced from time to time, such as L-410. Two-piece camera/VCR systems rapidly displaced Super 8 mm film as the medium of choice for shooting home movies and amateur films. These units included a portable VCR, which the videographer would carry by a shoulder strap, and a separate camera, which was connected to the VCR by a special cable. At this point, Beta had several advantages over VHS systems. The smaller Beta cassette made for smaller and lighter VCRs. However, consumers wanted a one-piece solution. The first one-piece consumer camcorder, the Betamovie, came from Sony. 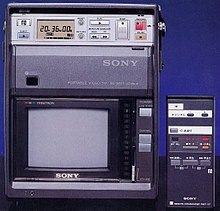 A major requirement for a one-piece camcorder was miniaturizing the recording head drum, and Sony's solution to this involved a nonstandard video signal which would become standard only when played back on full-sized VCRs. A side effect of this was that Beta camcorders were record-only: consumers saw this as a major limitation. VHS manufacturers found a better solution to drum miniaturization (it involved four heads doing the work of two). Because it used standard video signals, VHS camcorders could review footage in the camcorder and copy to another VCR for editing. This shifted the home movie advantage dramatically away from Betamax, and was a primary reason for the loss of Beta market share: owners of Beta VCRs found that a VHS camcorder would allow them to copy and edit footage to their Beta deck – something that Betamovie could not do. If rental movies were not available in Beta, they could rent them in VHS and use their camcorder to play them. Owners of VHS VCRs could also choose a variant camcorder format called VHS-C. This used a miniaturized cassette to make a camcorder smaller and lighter than any Betamovie. Sony could not duplicate the functionality of VHS-C camcorders, and seeing the rapid loss of market share, eventually introduced the Video8 format. Their hope was that Video8 could replace both Beta and VHS for all uses. For more information, see the article on camcorders. On November 10, 2015, Sony announced that it would no longer be producing Betamax video cassettes. Production and sales ended March 2016 after nearly 41 years of continuous production. Third party manufacturers continue to make new cassettes. While these cassettes are designed for use with the Betacam format, the cassettes are interchangeable with traditional Betamax systems. For reasons Betamax lost to VHS, see Videotape format war. The VHS format's defeat of the Betamax format became a classic marketing case study. Sony's attempt to dictate an industry standard backfired when JVC made the tactical decision to forgo Sony's offer of Betamax in favor of developing its own technology. JVC felt that accepting Sony's offer would yield results similar to the U-Matic deal, with Sony dominating. By 1980, JVC's VHS format controlled 60% of the North American market. The large economy of scale allowed VHS units to be introduced to the European market at a far lower cost than the rarer Betamax units. In the United Kingdom, Betamax held a 25% market share in 1981, but by 1986, it was down to 7.5% and continued to decline further. By 1984, 40 companies made VHS format equipment in comparison with Beta's 12. Sony finally conceded defeat in 1988 when it, too, began producing VHS recorders (early models were made by Hitachi), though it still continued to produce Betamax recorders until 2002. In Japan, Betamax had more success and eventually evolved into Extended Definition Betamax, with 500+ lines of resolution. Peep search – A picture search system pioneered with Betamax and available on most video formats since. U-matic – The predecessor to Betamax, using 3/4-inch tape instead of 1/2-inch. Compact Video Cassette – Competitor product developed by Funai and Technicolor using 1/4" tape format. Betacam – Umatic's replacement. A non-compatible, high-quality standard used by television studios and other professionals. DigiBeta – Betacam's replacement. A non-compatible, digital high-quality standard used by television studios and other professionals. Video8 – A small form factor tape based upon Betamax technology, using 8 mm tape. ^ McDonald, Paul (2007-08-06). Video and DVD Industries. British Film Institute. p. 33. ISBN 9781844571673. Retrieved 6 June 2012. ^ "Betamax". Pcmag.com. 1994-12-01. Retrieved 2012-09-16. ^ "Beta Video Cassette and Micro MV Cassette Tape End of Shipment Announcement". Sony Japan. Sony. 10 November 2015. Retrieved 10 November 2015. In March 2016, Sony will end shipment of the Beta video cassette and micro cassette MV. ^ "CED in the History of Media Technology". Cedmagic.com. 1977-08-23. Retrieved 2012-09-16. ^ "1975 – The Sony SL-8200 long play VCR". Rewindmuseum.com. Retrieved 2012-09-16. ^ a b Dave Owen (2005). "The Betamax vs VHS Format War" (video). Mediacollege.com. Retrieved 2012-09-16. ^ "BETAMAX CASE". Museum.tv. Retrieved 2012-09-16. ^ Harris, Paul. "Supreme Court O.K. 's Home Taping: Approve 'Time Shifting' for Personal Use." Variety (Los Angeles), 18 June 1984. ^ Steven Ascher, Edward Pincus (2007). The filmmaker's handbook: a comprehensive guide for the digital age. p. 38. ISBN 9780452286788. Retrieved 2012-09-16. ^ "Why Beta is Better". Betainfoguide.net. Retrieved 2012-09-16. ^ "Betamax the Better Format". Palsite.com. Retrieved 2012-09-16. ^ "Sony SLO-1700 specs". Palsite.com. Retrieved 2012-09-16. ^ "Sony SuperBetamax demo tape on youtube". Youtube.com. 2010-09-03. Retrieved 2012-09-16. ^ "Sony Super Betamax Model SL-HF600". Betamaxcollectors.com. Retrieved 2012-09-16. ^ "tapes Extended Definition" Betamax". Palsite.com. Retrieved 2012-09-16. ^ "Beta by Sony list". Joeclark.org. 2004-12-26. Retrieved 2012-09-16. ^ "BetaMax history". Floridahomemovies.com. Archived from the original on 2017-05-07. Retrieved 2012-09-16. 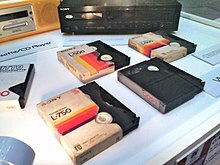 ^ "Sony says goodbye to Betamax tapes". BBC News. 2015-11-10. Retrieved 2015-11-11. ^ Luís Cabral and David Backus (2002-08-28). "Betamax and VHS (Firms and Markets mini-case)" (PDF). New York University. p. 4. Retrieved 2014-01-13. ^ "Sony Finally Throws the Betamax on Scrapheap". Los Angeles Times. August 28, 2002. Retrieved 2012-09-16.